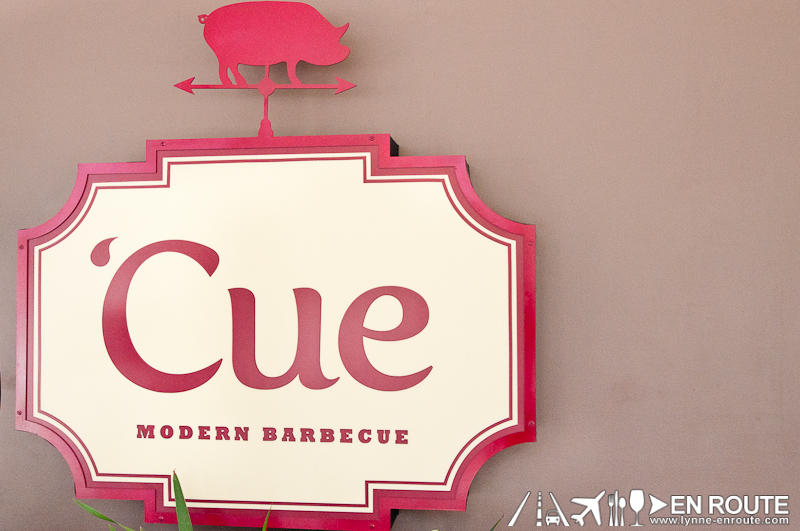 Queue up for Some ‘Cue, Modern Barbecue! Lucky to have tried this a few days after it opened, because by now, it will take some time to get a seat. 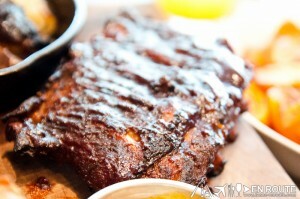 Such is the demand for the goodness that comes out of the kitchen of ‘Cue Modern Barbecue. ‘Cue Modern Barbecue is just one of the many specialty restaurants that have emerged in the new Bonifacio High Street Central. And what is their specialty? Just good ol’ fashioned meat, but meat that is roasted, grilled, and fried to greatness. There are a lot of barbecue places out there, but the variety of flavors of ‘Cue sizzles the competition charred and blackened. 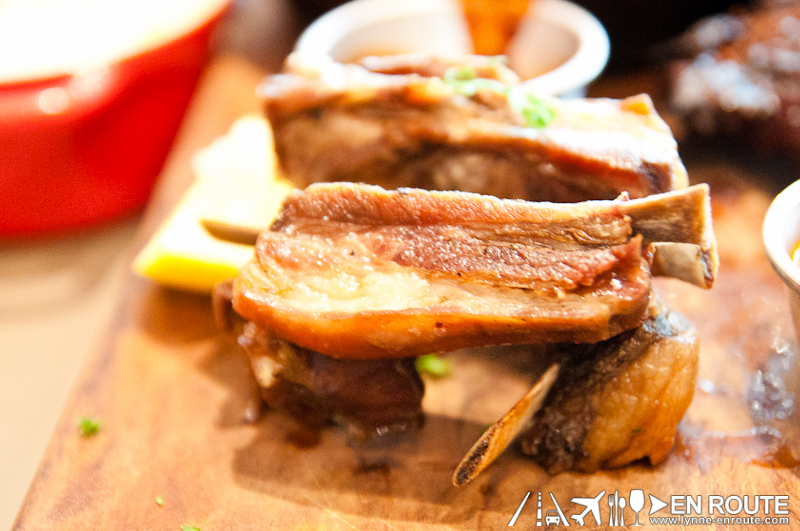 It may not be Filipino taste inspired, but its taste has inspired the Filipino food lover. The concept is simple: just create some of the best tasting meat selections, and give a variety of sauces for everyone to try. It just makes total sense. Oh, and a selection of beers and spirits aren’t bad at all 🙂 These actually enhance your apetite. 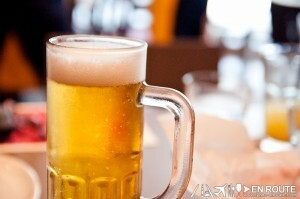 For non-alcoholic selections, you can try some of their shakes. 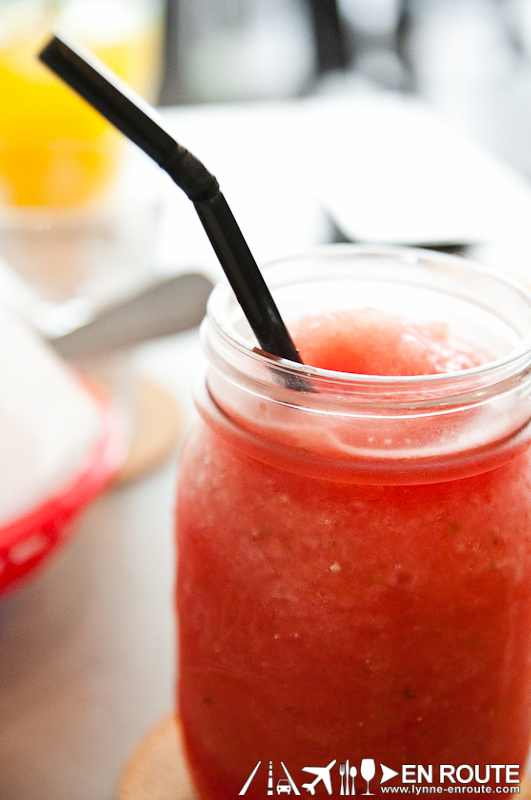 the watermelon-mango-mint shake is just the refreshing drink you would want for the Philippine weather. It’s like a watermelon mojito, just without the rum. 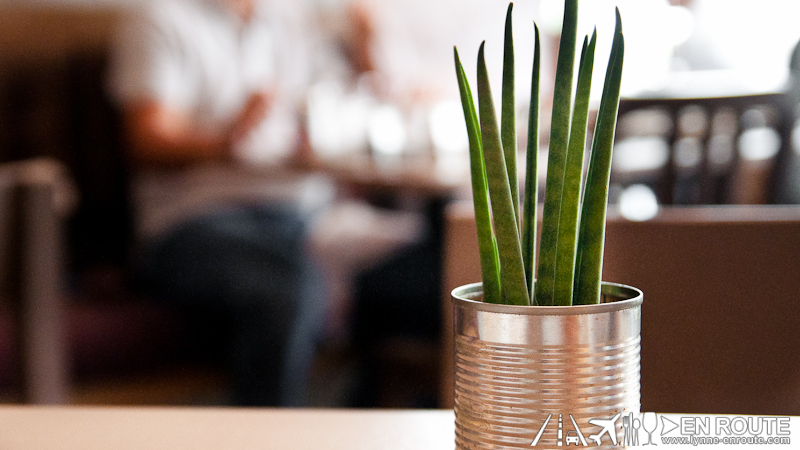 There are other fresh fruit shakes available too! 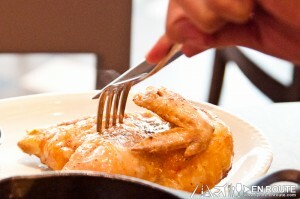 This secret may be out by now: The Fried Buttermilk Chicken Wings (PHP 355.00). 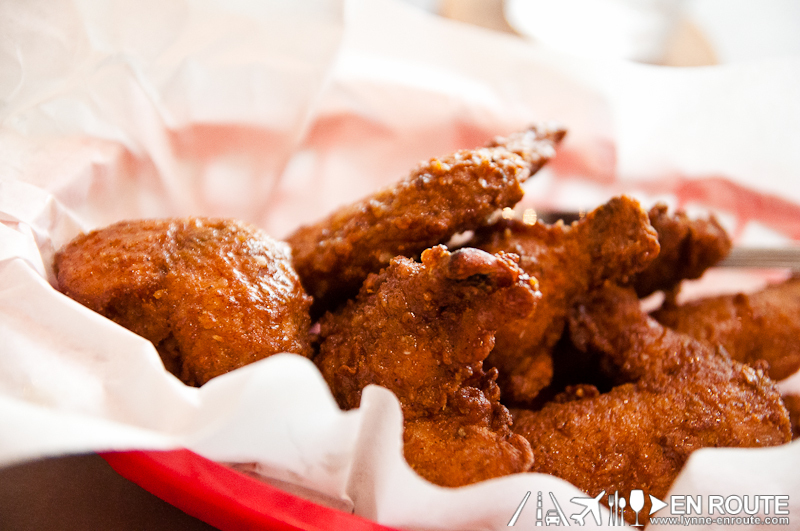 Chicken wings coated in a sweet-salty-spicy batter, then fried to a delicate crispiness. The batter tasted something very similar to the batter of an onion ring. This was pure genius. People will find it difficult to share this as the flavors of the batter mix with the delicate crisp and juiciness of the chicken. Quite addicting! So now you’re done with the appetizer, staring at a ceiling that is partly covered in cow hide, wondering what you should get from their menu: Beef? Pork? Chicken? Lamb? There’s an answer to that: Just get all of them 😀 ! 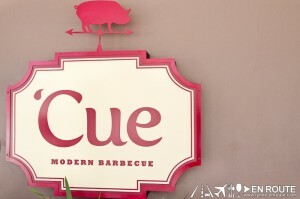 ‘Cue Modern Barbecue has a sampler platter called “A Lil’ Feast” (PHP 1,785.00) that is good enough for four people, and with a sample of the following: lamb ribs, beef belly slices, baby back ribs and roasted chicken. This is like an altar of tribute to some of the best tasting and cooking of barbecued and roasted goodness. The beef belly slices are melt-in-your-mouth soft, the baby back ribs have the great smoky flavor with your choice of either dry or wet rub, and the roasted chicken? Even if it takes almost half an hour is well worth the wait. It holds the juiciness into the white meat parts, strangely succulent with little help from any seasoning. 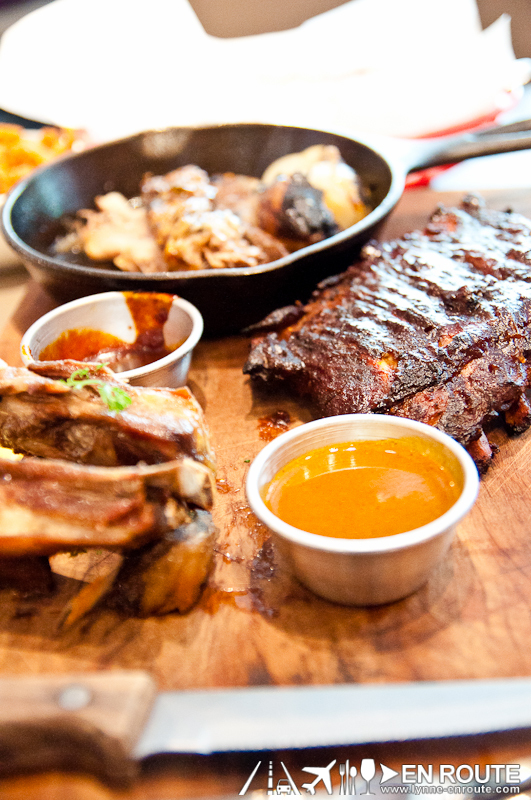 It may look small, but this platter packs quite a wallop with its all meat ensemble. Feel free to explore the menu as they have some lighter alternatives from lamb or fish. 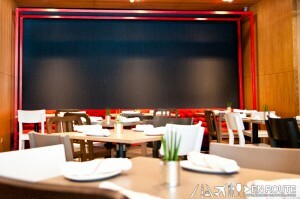 Although those barbecued selections will definitely be eye catching. ‘Cue Modern Barbecue is heaven sent, with its great recipes and spot-on cooking methods, just bringing out the best of what the domesticated portion of the animal kingdom has to offer for the meat loving man. 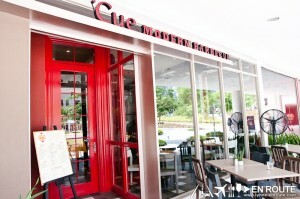 ‘Cue Modern Barbecue is located at Bonifacio High Street Central, Fort Bonifacio Global City, Taguig, Philippines.